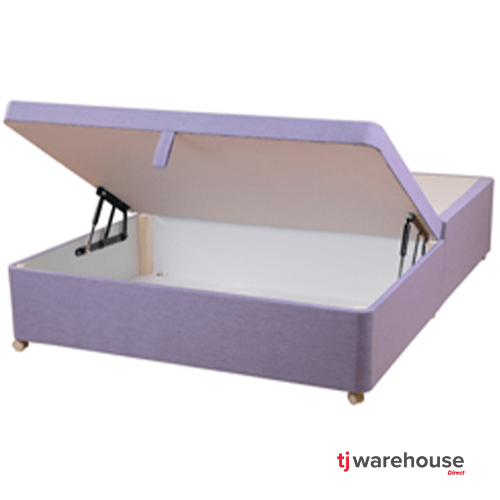 This bed base is ideal if you do not want a look of a bed frame but prefer a divan type bed base which is low with legs instead of the traditional deep divan type base on castors. The Frame of the bed base is constructed with a pine which is then upholstered with a fabric and colour of your choice. The Picture shows the Base with legs fnished in Black Faux Leather. The assembly couldn’t bed easer all you need to do is to attach the legs and headboard and place the mattress on top and that’s it!. A matching headboard comes complete with the base and is easily attached to the base with two headboard fixings screws. The Chrome legs simply screw in bottom of the base. The base comes two pieces for easier transportation then simply clip together to form one base.